Some birds can't fly! : Country roads take me home..
Country roads take me home.. Probably, the Great Barrier Reef is the best thing I ever found in Australia. So I really wanted to explore it since day one. My first time in the reef in 2012 was amazing. In fact, it was like meeting a pen-pal because I could imagine how it look like before seeing. I had already done my research, seen videos and etc. Yet, my next tour in 2013 was a total disaster. As soon as I landed from Cairns airport and reached the hotel, I heard the news of my worst nightmare: region was expected to be hit by a hurricane and no one was allowed to jump in to sea. Only thing I could do was just snorkeling in Green Island once the weather improved, yet water was still murky. After another year I realized that I am ready for an expedition; a bit more adventurous one. So I decided to sail up to the ribbon reefs about 100 miles away from Cairns. That means I am going to live in a boat for few days. Due to my personal reasons I didn't have much time to plan or wait for the right season... Ok, no worries…I am going to do this in winter! Then I headed to Cairns the day before I am going to start the expedition and stayed in a backpacker’s hostel. Next day, started the expedition in the boat called Spoilsport. 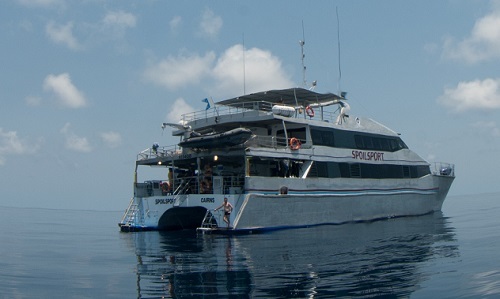 She is a majestic looking gentle giant with purposely built diving deck and facility for underwater photographers. Anyway, when I boarded the boat, again I had to start with a bad news from Nick, who is the diving director. "Guys, we got a kind of bad news.. Forecast shows that sea is going to be choppy in the coming days"
Ok, you tell whatever you want.. But I am not going empty handed this time.. I came to dive and shoot the reef. I told to myself. On board was interesting bunch of people from countries such as Australia, USA, Japan, New Zealand, Colombia and etc. 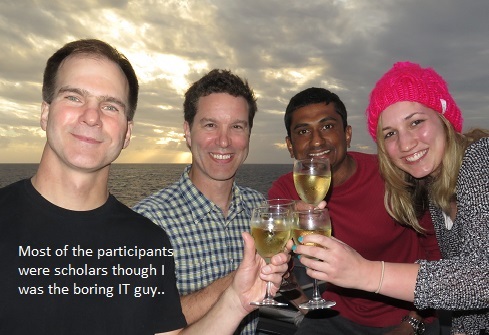 Most of them were scholars while I became the only boring IT guy. My cabin mate was a quite strange looking diver from Georgia who never smiles or hardly show any emotion. He has been a marine corp. with combat experience who later on moved to a far different living; growing flowers! By the way, one thing common for us… we both were solo travelers! John spoke Spanish too, in fact he became friends with two young doctors from Colombia. Then I was shocked to know my strobe (Underwater Camera flasher) was faulty. It was discovered in my first dive which was done in one of the most famous dive sites in GBR called Codhole. That name was given to the site because you find huge Potato Cods quite frequently. Problem with the strobe was, it worked some occasions, but failed next moment. I had to bear the bitter truth of problems I have with shooting. I am literally hundreds of miles away from the main land to shoot underwater yet my gear is mal-functioning! May be I will have to make my mind to grab what is in store for me, if not photography. As Nick mentioned, it was the worst choppy sea Spoilsport encountered in months. Diving was actually a challenge for me though it was different for ex-marine corp., John. Always, we had to go down using the anchor line, otherwise we would end up drifted to open ocean and it will not be a nice experience. One important piece of gadgets we carried due to this condition was a powerful GPS device. Transmitter is capable of sending signals with relevant GPS coordinates to captain’s cabin or even to any other boat within 200 nautical miles. Still you have to be conscious enough to operate it wisely. Water temperature was not unbearable. Still you can get hypothermia if it happened to stay in water for extended periods of time. In person, I took this opportunity to check my stamina as a diver in inhospitable conditions. 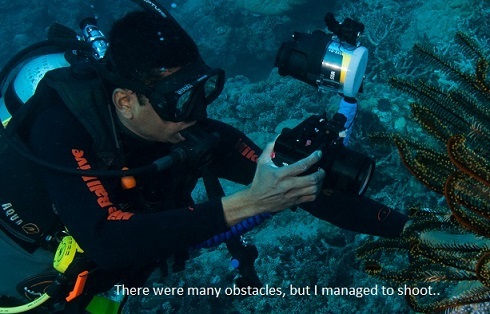 In terms of shooting, my strobe was sometimes kind enough to allow me shooting… in fact, I made 110% from my side ending up shooting few good shots including few Clown fishes, shark, Stonefish and more wide angles with different reef formations. I am happy about it. Failure of strobe may have taught me another lesson. You have to expect failure and need to accept it. Most of all I had the rare opportunity of shooting under the guidance of world class photographer, Julia Summering. She was kind enough to share her vast knowledge yet humble enough to admire the work of armatures too. In her career, she had contributed to National Geographic and Discovery channels. We had to sail even in the night to reach some of the remote areas of GBR. When sea was so bumpy, furniture and other stuff was tied, otherwise they would move here and there resulting even injuries. Sleeping was a far cry when the boat moved up and down like a roller-coaster. I was even scared falling down from my bunker bed, which is the smallest bunker bed I have ever slept on. One other great dive site was called Steve’s Boomies. It is one of the most beautiful reefs I have ever seen… full of fishes in reef formation consist of a massive boulder raised high from the sea bed. We plunged in to it in early morning and sunlight was still entering the waters giving it heavenly colours. Anyway, the sea current was so strong and we had to make a big effort to stay still. I was sometimes thrown away with the force of the current. Before jumping, divers were also warned about venomous Stonefishes. Their venom is said to be one of the most painful ones. I was lucky enough to shoot one of these mysterious looking creatures. Steve’s Boomies has got a sad story of its own. There had been a nice young diver called Steve who loved this area and dived there so often with his friends. Later, Steve has died (there are different theories, but the most believed one was a Motorbike accident) untimely, putting all his friends in to utter sorrow. Those friends created a granite plaque carving Steve’s name on it and placed down the sea bed he loved most. Anyone who dives today too can see this lonely plaque with Steve’s name on it. After a hard day of diving, spending time on the deck looking at the vast ocean and vanishing light of the sun was an exciting experience. For some reason, it gave me some unexplained sadness. I became the smallest living object under the dark sky. It tends to make you to think over and over again about our own existence and its meaning. It’s a special feeling. By the final day, even with many obstacles, I had managed to do some good photography which made me thrilled. By then, everybody knew each other well. That evening was a special one by all means. Main event was the announcement of winners of the photo contest. If my gear was in order, I knew I would have aimed to be admired of my work. By this time I knew I was out of the competition, yet I had the slightest hope of being at least 2nd runner-up, if luck is in my favor. Julia started the presentation, explaining ups and downs of few photos, then announced the winners. 2nd runner-up was Christine, who was a University lecturer from New Zealand. Once I heard her name, I was sure that I am not going to have anything. That’s alright, I should be still proud of my courage to come this far alone and brave enough to participate in this exercise with many pros. Then Dana’s name was told as the 1st runner-up. I knew she deserves it, because I was down there when she captured a beautiful shot of a Sea-snake. You should be very clever to shoot them because they move very fast, leaving you no second chance. Dana was a middle aged lady travelling with her husband who wasn’t a diver, but accompanying her and helping her work. This nice American couple had shared their life stories with me previous night. Everybody got their own stories, which are different, yet close to yours in some way. “First place…. goes to …. Sume..dh..aa…” and she was struggling to say my surname. I couldn’t believe myself. 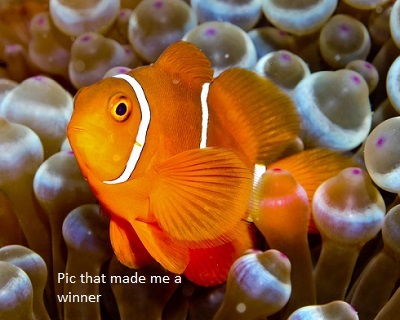 Yet, this should be true… I was witnessing the photo of Clown-fish taken by me on the wide screen. That was the moment of truth… when I got up, everybody clapped so loudly. For some reason, audience sensed my emotional state I believe. I didn’t know what to do, yet suddenly, without any intension, I took my two hands together (like saying Ayubowan in Sinhala tradition) and bowed them. I was on top of the world. When I sat again, Dana came to me and congratulated. I wished I had my family around me, yet they were thousands of miles away. Then as I was returning from my Cabin, party had begun. Captain of the boat was an amazing guitarist. I can remember, when I entered the deck they started playing Country Roads by John Denver. I was looking at the fading sun of the horizon. No one on the deck saw my eyes being getting heavier and heavier with tears. Machan, congrats for the firs price. It's a really good one. and I can imagine how you felt. Happy for you man. Yep,it was an awesome stuff.. you too need to do for sure. I need to update this Blog, but with rich context.. with a vision.